From the early years of the Formula One world championship, it became obvious that improvements to safety would not just depend on the design of cars and circuits. Racing drivers began to realize that if they wore long-sleeved tops, protective helmets and goggles then they were less likely to hurt themselves in accidents. Crash helmets are the most obvious piece of safety wear for a driver — and they are the one item that a driver absolutely cannot do without. The material used: The helmets are made with the same ultra-strong materials that teams build cars with. The material must adhere to tough regulations to ensure it is strong enough to survive an accident. The helmets have to comply with similar kinds of crash tests that the cars go through as well. If they are at all damaged in a race then they will be replaced for the following event. Drivers usually get through about 15 helmets during a season — and discarded ones do become collectors’ items. How it is sized: Each driver has the helmet made to measure. This customized fit not only increases comfort when it is worn in action, but also ensures that the helmet is not likely to slip off in an accident or have gaps where fire or other debris could find their way inside the helmet during the races. Functionality and strength of the visor: The visor of the helmet has to be as strong as the rest of the helmet, but it also has to provide the driver with enough visibility. Some drivers fit special tinted visors to keep the sun out of their eyes, while all of them are fitted with tear-off strips that allow the driver to remove a layer if it is covered with oil or dirt. Drivers cannot risk smudges on their visors when racing at 200mph. Special padding: The inside of the helmet is full of special padding. This not only makes wearing the helmet as comfortable as possible for the driver, but also adds further protection in the event of an accident. The mouthpiece: At the mouthpiece of the helmet is a hole for a special tube that allows the driver to drink fluids during the race. Because of the incredible heat in a Formula One cockpit during the race, it is vital the drivers are kept well hydrated so they do not get tired and run-down, which could lead to them making mistakes and crashing out. Earplugs: Before drivers put on their helmets, they put in special earplugs to prevent their hearing being damaged by the very loud noise of Formula One engines —which is easily in excess of a Motorhead concert or a jet taking off. The earplugs also house the radio systems that allow drivers to communicate with their teams in the pits. Balaclavas: Drivers also wear fireproof balaclavas (a knit cap for the head and neck) to protect their head in the event of fire. Helmet technology —Top Gun in a car? Formula One drivers could soon be making use of the kind of high-tech Heads Up Display (HUD) technology that is now used every day by fighter pilots. Although the use of pit boards and radio communications now mean it is very easy for a driver to keep in touch with his team in the pits, there is still plenty of room for improvement. German car manufacturer BMW is looking at ways for special displays to be used in the helmets of their drivers that would warn them of dangers ahead on the track. The display could include information about warning flags, oil on the track and whether other cars have crashed out of the race. Grand Prix bosses are also looking at ways of automatically slowing down cars if there is an accident ahead, or if there is a chance that they might hit another car in poor weather conditions. This technology would have to be completely foolproof before it could be used in the sport though. Formula One drivers often look like walking advertising hoardings. Their multi-colored overalls are full of the logos of their sponsors as every single last piece of material is covered with the names and badges of the companies that support the teams. But the overalls the drivers wear are not just sponsor billboards, because they have a much more important use. The all-in-one overalls have to be worn for safety reasons — which is why they are worn whenever the car is being driven. The days of drivers wearing a shirt, trousers and flowing silk scarf to fight it out for grand prix glory are long gone. Now drivers are decked out in all sorts of safety apparel: overalls, boots, gloves, and more (see Figure 1). The following sections explain function and safety features of what drivers wear when they race. The driver’s overalls look similar to a baby’s romper suit. They zip up the front and cover their arms and legs. These suits are made of a special material called Nomex that is fire-resistant. The sport’s governing body, the FIA, demands that the material used must protect a driver from a fire of up to 700 degrees centigrade for at least 12 seconds — and the sponsors’ logos have to comply with this as well. To increase the drivers’ protection, they also wear T-shirts, underwear and socks all made of Nomex. All of this makes it very hot in the car for the driver, but it is a small price to pay in the quest for safety. 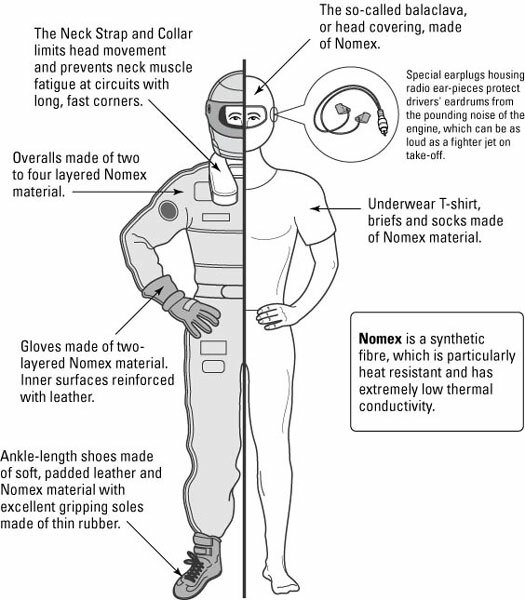 The use of Nomex is not just restricted to the overalls and underwear because the boots and gloves that the drivers wear are also made of this modern fabric — although comfort issues have to be considered in these areas. Gloves will be trimmed with leather to make sure that there is no chance of them slipping off the steering wheel at 200 mph, while the soles of the racing boots are very thin and made of rubber to ensure that the driver can feel exactly what is going on with the pedals. Although the overalls may provide protection in the event of serious fires, they do not protect the drivers from the bumps and heat of a Formula One cockpit. Some of the top stars also wear knee and ankle protectors to prevent bruises, while drivers have been known to get heat blisters from the bottom of their car. Driving is a dirty business and racing overalls are in a far from pristine condition at the end of the race — covered in sweat, oil, dirt and, if a driver has been successful, champagne. Some teams provide their drivers with a special jacket after the race that looks like the top half of their overalls so that they look pristine for the television cameras. These overalls have been nicknamed “bullet-proof vests” because they are made of specially toughened material to make sure the sponsors’ logos are completely flat and fully visible in photos and on television.